The percussion colourist, Duduka Da Fonseca once graced the drum chair of Dom Salvador’s album, simply entitled Transition… or was it so simple? Although the legendary pianist reveals the secrets of his heart in simple, yet breathtakingly lyrical songs, his impulse to adorn melodies gleam with a complex patina, where layer upon layer of colour and texture is twisted and turned in a voluptuous, rhythmic cocktail Brasiliana – where the very earth (every glistening speck of the Ipanema sand) awakens each day to a mistura fina of sertanejo, samba, bossa nova, pagode, tropicália, choro, maracatú, embolada (coco de repente), funk carioca, the glue of which is in the sometimes distant echo of even afoxé, maracatú, capoeira music and repente. Something like that music, refined over years of performance with Jorge Ben, Elza Soares and Elis Regina came to New York and stayed and continues to light up a residency at the River Cafe since 1977. So the music has been bubbling and brewing and coursing through Duduka Da Fonseca’s veins for thirteen long years and a salubrious summer in Rio, in 2017 seemed as good a time to return the favour. 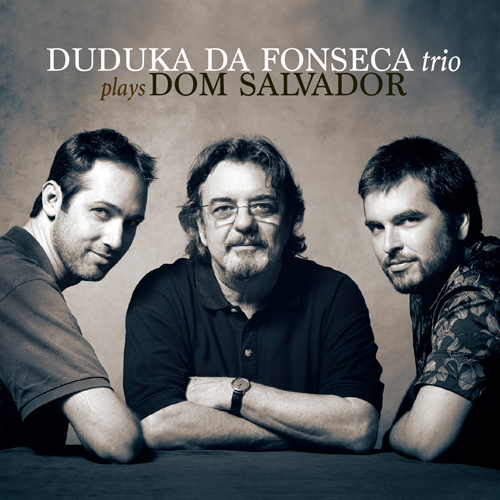 Thus was born this glorious Duduka Da Fonseca trio recording Plays Dom Salvador. There are eleven songs, one more viscerally exciting than the other and each played with nuanced poetry by Duduka Da Fonseca, David Feldman and Guto Wirtti on bass, with the great Jaques Morelenbaum gracing Dom Salvador’s tender ballad (“Para Elis”) dedicated to that Brasilian Goddess, Elis Regina, whose child-like laughter is almost discernable in the echoes of David Feldman’s superb harmolodics – a beautifully rhythmic volta face from the jack-rabbit high jinks with which he helps his leader open the proceedings, on “Farjuto”. From that beginning to its bookend in “Meu Fraco é Café Forte” it’s one gorgeous performance after another. Few performances of Dom Salvador’s dreamy masterpieces have been encapsulated the overwhelming passion of their musical arguments to the same degree as this brilliant recorded account. Duduka Da Fonseca has a clear and unified vision of the music’s trajectory, his interpretations grabbing you by the heartstrings – in the interminable lyrical languor of “Transition” – or by the scruff of the neck, compelling you to follow Dom Salvador’s spontaneous and characterful account of “Samba do Malandrinho”. The trio’s whirling response to Dom Salvador’s eternal “Gafieira” sail through the song’s technical demands into a warm and not-over-sumptuous tone of expression, which is especially the case with Guto Wirtti’s base lines, something he had given notice of in a short solo on “Mariá” earlier . Of course, in addition to the masterfully spun purity and spotless intonational poise are all the work of the exceptionally beguiling Duduka Da Fonseca, whose mastery can be heard in every stroke of his hands on the skins of his drums – whether he wields stick, mallet or brushes. It’s no wonder that Dom Salvador declares on the package itself that “Duduka Da Fonseca has done for Brasilian drumming, what Kenny Clarke had done for Jazz drumming in America”, high praise for the bandleader, who returns the compliment in kind – the kind of which is heard on the disc’s crowning glory – “Valsa De Esquina”.